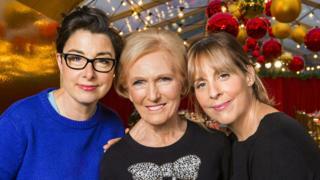 Former Bake Off stars Mary Berry, Mel Giedroyc and Sue Perkins are reuniting on screen for a BBC Christmas special. The trio were last seen together on The Great British Bake Off last year, but refused to join Paul Hollywood when the show moved to Channel 4. Mary, Mel and Sue's Surprise Party will see them visit a community centre in South Wales to bring festive cheer. Berry will make a special Christmas dinner for residents while Mel and Sue help give the centre a makeover. "I knew Mel would quit Bake Off too"
Why did Bake Off move to Channel 4? The BBC said the unnamed area of south Wales had "experienced some tough times" but residents had worked together to open a community centre after their post office and local school closed. They said the centre became a "lifeline" and, with the help of volunteers, had become "the beating heart of the community". This year, instead of those volunteers organising a Christmas party, Mel, Sue and Mary are throwing them a surprise party. Director of BBC content Charlotte Moore said it was a privilege to be working on the "comeback show" of "three of the most talented women on British television". When it was announced that the BBC had lost the rights to Bake Off, Mel and Sue quit the programme, saying they weren't "going with the dough". Meanwhile, Mary said she "avoided being asked" to join the Channel 4 version, as she wanted to stay loyal to the BBC. The cook has since launched her own series, Mary Berry Everyday, while Mel and Sue are due to present a revival of The Generation Game. And it's just been announced that Mel is to star as Beatrice in Much Ado About Nothing at the Rose Theatre in Kingston next year.